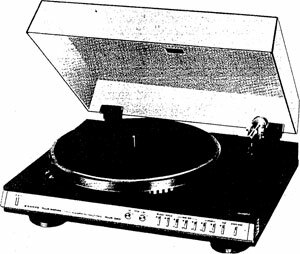 The Sanyo Plus Q50 Quartz PLL direct-drive turntable is a quality piece of electronic equipment, skilfully constructed from the finest solid-state components. It's drive system utilizes a two speed control system with a quartz-locked PLL servo motor for ultra steady platter rotation at nominal speeds and an FG servo to maintain speed constancy while allowing for pitch control variations. It's automatic operation, unlike most other turntables, is not a deterrent to performance because the Plus Q50 incorporates a second, totally independent motor for all tonearm functions. Sanyo Plus Q50 / Q-50 owners manual, service manuals and schematics are for reference only and the Vinyl Engine bears no responsibility for errors or other inaccuracies. The PDF files are provided under strict licence. Reproduction without prior permission or for financial gain is strictly prohibited. This website is not affiliated with or sponsored by Sanyo.